Accompanying the Jean-Luc Godard show at the Centre Georges Pompidou – detailed last issue by Alex Munt – is an exhibition catalogue co-edited by Michael Temple (1). The catalogue arrived not long after For Ever Godard, an anthology also co-edited by Temple that prompted many reminiscences in the press (2). For Ever Godard is the second such anthology Temple has co-edited (the first dates from 2001) (3). None of these books has made the others redundant. Temple has been publishing in English and French about Godard for almost a decade and has not run out of things to say. While this work has attracted wide notice, he has also been quietly writing about Jean Vigo (4). His recent monograph on the director, published in Manchester University Press’ French Film Directors series, went almost entirely without review. The mandate of the French Film Directors series is one of tidy, anti-auteurist biography; the director, as the series-wide foreword tells us, “will be treated as one highly significant element in a complex process of film production” (p.vii). Throughout the series, this aim is variously achieved and not; Temple, for his part, devotes considerable space to production history and – notwithstanding one slip-up wherein Vigo is referred to as “the master” (p.159) – questions the necessity of Vigo’s romanticised, cinéaste maudit status. This he accomplishes by synthesising the work of certain French biographers and offering brief critiques of the same. Above all, Temple draws (frequently in lengthy quotation) from P. E. Salles Gomes and Pierre Lherminier’s efforts (5). While this can amount to rehearsals of familiar arguments, and “according to Salles Gomes” is an indicative refrain (p.97), Temple has nonetheless produced the most well-organised and lucid introduction to Jean Vigo yet available in English. Jean Vigo’s structure is decidedly programmatic, verging on a Barry Saltian statistical analysis during discussions of Zéro de conduite (1933) and L’Atalante (1934). Films are broken down by location and action, offering a chart with running times for each segment. This approach is pedestrian for L’Atalante, where it serves only as a means of comparing scenes from the film with those from Jean Guinée’s original scenario in order to emphasise Vigo’s alterations. Elucidating neither film nor script, the practice seems retrograde in an otherwise impeccably modish volume. His analysis of Zéro de conduite, on the other hand, is revelatory: a palindromic structure is found in the film, whereby the first scene is thematically echoed by the last, the second scene by the second last, and so on to the schoolyard heart of the film. It is a persuasive reading, and one that goes a long way to dispose of the ubiquitous assertion that Zéro de conduite is largely opaque and rambling – an impression that allowed Vigo to be misread as a Surrealist. In fact, proprietary claims on Vigo by various camps have been the bane of the critical corpus devoted to his works. Many have argued that Vigo is a Surrealist au fond – the mystifying shots of Juliette (Dita Parlo) licking a block of ice in L’Atalante, which were temporarily included in certain versions of the film, have probably done nothing to discourage this reading (6). Vigo has just as frequently been understood as the first martyr to cinema, a role that has encouraged prodigious hagiography and such misguided homage as Lindsay Anderson’s If… (1968). Finally, both pejoratively and in fellowship, Vigo has been called an anarchist. The stance of a given critic towards anarchism is generally revealed by whether they simply mention Vigo’s well-known, if lapsed, anarchist father (dismissive) or the bourgeois-baiting anti-authoritarianism intrinsic to À propos de Nice (1930) and Zéro de conduite (supportive) (7). Temple, who comments upon both anarchic paternity and theme, tacitly favours this final configuration. In the main, however, Temple is dismissive of the libertarian left and these allusions to anarchism seem to have more to do with an imbedded argument that Vigo’s oeuvre is fundamentally carnivalesque. While Jean Vigo is almost entirely theory-free (this is not a mandate of the French Film Directors series; other monographs, such as that devoted to Georges Méliès (8), are heavily theoretical), one perceives that Temple has a separate essay on the vine which would allow for what is here, “ludic,” and there, “carnivalesque,” to refer specifically to the absent theoreticians of these terms, Johan Huizinga and Mikhail Bakhtin. As it stands, the argument is advanced through asides found in every chapter: one of the carnival grotesques in À propos de Nice is inverted, and Temple wonders if this suggests the desired upheaval of the bourgeoisie; Taris ou la natation (1931) (9) is viewed as a “celebration of the playful body, a motif of freedom and pleasure that we also find in the Carnival sequences of À propos de Nice” (p.41); and a “comical, even carnivalesque tone” is even to be found in L’Atalante (p.116). It is a pity that Temple did not have the opportunity to develop these notions, for they are intriguing and would probably satisfy any of Vigo’s devoted camps. A manifest passion is to be found in Jean Vigo, and Temple’s inspired prose here suggests that he can be just as enraptured with Père Jules – and so, Vigo – as can Juliette. Jean Vigo, by Michael Temple, French Film Directors series, Manchester University Press, Manchester, 2006. Nicole Brenez, David Faroult, Michael Temple, James S. Williams and Michael Witt (eds), Jean-Luc Godard: documents, Centre Georges Pompidou, Paris, 2006. Temple, Williams and Witt (eds), For Ever Godard, Black Dog, London, 2004. Temple and Williams (eds), The Cinema Alone: Essays on the Work of Jean-Luc Godard 1985-2000, Film Culture in Transition series, Amsterdam University Press, Amsterdam, 2001. Temple, “Dreaming of Vigo: the Myth of the cinéaste maudit”, Sight and Sound, vol. 8, no. 11, November, 1998, pp.14-15; Temple, “Montage, mutilation et miracle, dans L’Atalante de Jean Vigo”, La Chouette, Autumn, 1998, pp.79-84. 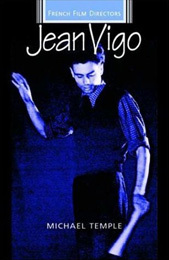 P. E. Salles Gomes, Jean Vigo, Faber and Faber, London, 1998; Pierre Lherminier, Jean Vigo: Oeuvre de Cinéma, Cinémathèque Française, Paris, 1985. Raymond Durgnat, “L’Atalante”, Monthly Film Bulletin, vol. 57, no. 673, February, 1990, pp.54-55; Manuel L. Grossman, “Jean Vigo and the Development of Surrealist Cinema”, Symposium: A Quarterly Journal in Modern Literatures, no. 27, Summer, 1973, pp.111-125; Stuart Liebman, “Jean Vigo’s À propos de Nice: A Surrealist City Symphony”, Millennium Film Journal, no. 1, Winter, 1977-78, pp.12-20. Richard Porton has detailed the salient aspects of Vigo’s relationship with anarchism in his Film and the Anarchist Imagination, Verso, London, 1999, pp.195-212. Elizabeth Ezra, Georges Méliès, French Film Directors series, Manchester University Press, Manchester, 2000. Also known as Taris, roi de l’eau and La Natation par Jean Taris, champion de France (Temple, p.167).